The nuclear nation of China is constantly seeking advancements in their military and weapons technology, but they seem to be going at breakneck speed right now. The Communist nation is looking to link up the tanks to aircraft and satellites and make them work in more deadly ways than their human-driven versions, according to the Daily Star. 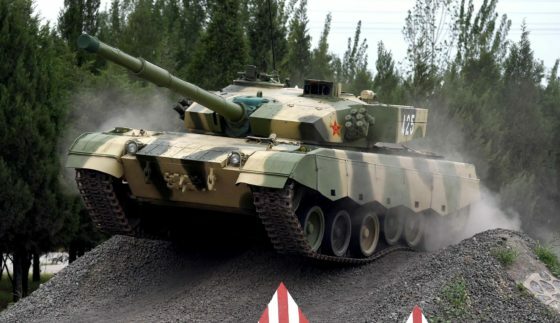 Chief editor of Tank and Armoured Vehicle, Liu Qingshan said the Chinese will be capable of continuous combat with greater speed and higher lethality thanks to these tanks. This news comes as the country looks to revolutionize its already dangerous armed forces. Recent footage shown on Chinese media reveals the country’s deadly unmanned tanks are now in their testing stage. This major overhaul of the People’s Liberation Army (the Chinese military) is occurring during ominous times when fears of a third world war are at the forefront of the minds of people globally. Russia is also thought to have gone at least this far in the development of unmanned tanks and weapons. It said new Russian Armata main battle tank will have the potential to be fully unmanned. Because of Russian and Chinese advancement in military weapons, the United States has been stepping up their quest for more military might as well. Army and industry weapons developers in the US have begun work on an advanced next-generation Abrams tank specifically engineered with new weapons, ammunition, laser-spotters, and advanced thermal sights able to outrange, outgun and outmatch the most modern Russian and Chinese tanks, service and industry officials said. “Right now we are at parity with near-peer competitors, and a sight upgrade will give us operational overmatch,” Lt. Col. Justin Shell, the Army’s product manager for Abrams, said recently at the Association of the United States Army annual convention. The general consensus is that China is all but ready for an all-out world war and Russia is not that far behind.